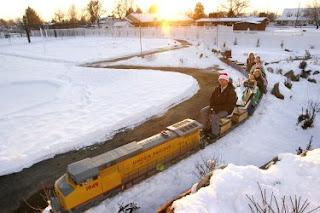 We wanted to let you guys know that the Polar Express is coming up at our neighbor's house that has the train. We were able to get a reservation to ride it on Dec. 10th at 8:20 PM. That is the day that they had set aside for ward members and that was the only time they could get all of us. Obviously there is no obligation to come but we figured we might as well make a reservation in case you want to come. We would invite the rest of you but we realize it might be a long drive for a 10 minute train ride. (If you want to see more pictures go to their website at http://stringtown.us).